My name is Fern May and this history is a compilation of all information found on the Ferguson/Merryman families that are related in some way to my mother, Ola Rada Ferguson. This history has been confirmed with copies of birth, death, marriage certificates, deeds, wills, church and baptism records, family bibles, personal letters, census records, old tax lists, obituaries and as received from contributors. If mistakes have been made, I would appreciate the correct information so that a more complete and accurate family history may be published at a later date. Send data to Fern May at the email found near the bottom of the page. Ola Rada's parents were Mary Sue Merryman and George Marcus LaFayette Ferguson. George's father was Andrew Jackson Ferguson. I am listing Andrew & his descendants here in the hopes of making connections with others researching these lines to find Andrew's ancestors & more on his descendants. I haven't been able to prove it yet but I believe that Andrew is the son of William Ferguson (1791-Aft. 1862) and Martha Ann "Patsy" Daniel/McDaniel. I have a genealogy database of over 10,000 names that are either Ferguson's or Merryman's either by birth or marriage. The Ferguson line goes back to Mississippi to about 1830 (further if I can prove William is his father) and my Merryman line goes to the early 1700's in Virginia. The link beside Andrew's name in the descendancy record below takes you to William Ferguson's page & the link to the Merryman line can be found near the bottom of this page. Here is a link to some message boards for the Ferguson family. Post your queries here and you may find someone else working on your line. Good Luck! Here is a link to Find-A-Grave. I have posted some of my Ferguson relatives on it & hope to keep adding more as time permits. If you have any more information, such as obituaries or photo's on someone I have on there, send it to me and I will add it to their record. Here are names and email addresses of other Ferguson researchers on my line. If you are a Ferguson researcher, or know of one, and would like to be added to this list, please email me and I will add them. Here is a link to a Ronald Ferguson's web site. He is from Northern England & although we don't believe he is connected to us I thought you might want to check his site out as it is very interesting & he has tutorials & other help ideas. George was the son of Andrew Jackson Ferguson and Elizabeth Redden. Born March 31, 1876 in Vaiden, MS. He came to Robertson County, Texas at 8 years of age. He married first Martha Emma Merryman on March 15, 1900 and they had two sons. She died and he married Martha's younger sister, Mary Susan Merryman on May 15, 1909. They had 9 children. He was a farmer and opened his home to one and all and he would drop everything to go help someone. The main things that I remember about grandpa is that he was tall and skinny and had a handlebar moustache. Also, he would not wash his feet with his hands. He would stand up in the wash tub and rub one foot with the other. He said feet were nasty and shouldn't be touched. I don't know if he really felt that way or was just putting on a show for the grandkids. Below is all I know about his father and mother. If anyone can help me with finding out more on this family, please contact me at my email listing below. Elizabeth was the second wife of Andrew Jackson Ferguson. The 1880 census states she was 30 but his oldest child was 21. I believe that only the two youngest children were born to Elizabeth. Apparently Elizabeth lost her husband in Mississippi and came to Robertson County, Texas with her children in about 1884. Andrew and his older children were never found in Texas. Possibly she had relatives there as there are some Reddens in Robertson County but no connection has been found yet. One that I found is a Zacharia Taylor Redden living in Robertson County that says he was born 1850 in AL. Could he be a brother to this Elizabeth? His daughter, Lula Mae married James Matthew Merryman. See his family attached to Lula Mae Redden at the Merryman page. A link to the Merryman page is found near the bottom of this page. There is a story that she and her children walked to Texas and carried their belongings in a wheelbarrow. She remarried a Jerry McDonald & possibly a Fulton in between the two. She is buried at Hoxie Chapel Cemetery in Easterly, Robertson County, Texas in an unmarked grave. Living two farms away in dwelling 65 is Bettie's son, George Lafayette Ferguson, from her first marriage. The 1910 census states that she was only married twice and only had one child but in the 1880 census it list's two children much younger than the first four so we were assuming that they were hers? Nolle, age 11, listed as a daughter in the 1880 census was assumed to be from Andrew's first wife but she isn't listed in the 1870 census & she should be if her age in 1880 is correct. Could be the age is wrong or she could be a daughter of Elizabeth's from a previous marriage & if that is so, Redden may not be Elizabeth's maiden name but her married name? Also, it is possible that George & maybe even Elizabeth is not hers but from the first wife or maybe even another wife that we don't know about if the 1910 census is correct in saying that she only gave birth to one child? See Andrew's notes below for this census. Any help anyone can give on Elizabeth would be greatly appreciated. Listed below is the descendancy chart for Fern's oldest ancestor for the Ferguson line. Then below that will be link to the Merryman line. These three are living in dwelling #432. Next door in #431 is John J. (who I believe is Oscar's brother, John Jackson) and next to John, in dwelling #430, is Jas. A. (James Alexander) another brother of Oscar's. On the other side, in dwelling 433, is Jackson D. Ferguson, age 29, and a Stephen Kent. All of these men are woodcutters. I believe this is our Andrew J. The age would be correct and place of birth. Oscar M. Ferguson would be Oscar Marion, son of William Ferguson born 1791 in SC. I think the Austin Ferguson is a cousin of theirs and is the son of Johanna Ferguson Austin, who is a sister to their father, William. Listed on the same page with Andrew was a William Ferguson, R(ichard) E(llison) Ferguson, and J(oseph) J(efferson) Ferguson. I believe Andrew is related to these Fergusons, possibly his brothers. Where is Nolle in this census? The 1880 census below has her as 11 so she should be here if that is correct, unless her age is listed wrong or possibly she is the daughter of Andrew's 2nd. wife, Elizabeth from a previous marriage? Living three farms away in dwelling 58 is Richard Ellison Ferguson (son of William) & his daughter, Rebecca. Montgomery Co. was not formed until the 1870's. It was formed out of Choctaw and Carroll Counties, so Vaiden, which was in Choctaw, became part of Montgomery Co.
Next door to Andrew is a Eleson Ferguson who is 56 years old and lives with a James Fultze, his wife and two daughters. This is Richard Ellison, son of William, and James is a son-in-law, married to Richard's daughter Adna. The 1860 & 1870 census shows Andrew as being born in LA but in 1880 it says MS. If Andrew is the son of William, born in 1791, then LA is most likely correct as William actually moved from SC to LA, then to Amite Co., MS, then to the Vaiden area. Andrew states in 1880 that his parents were born in SC and William came from SC so this is further proof that William is his father. Plus he also named his first son William. Andrew married Sela/Sealy (FERGUSON) . Sela/Sealy was born about 1840 in MS.
+ 2 M i. William L Cainey FERGUSON was born about 1859 in MS.
3 M ii. McCulock "Cull" FERGUSON was born about 1862 in MS.
4 M iii. 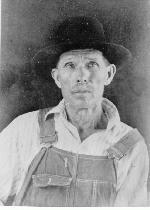 James King FERGUSON was born 31 May 1866 in MS, died 10 Dec 1936 in Poplar Creek, Montgomery Co., MS. Buried at Pine Bluff Cemetery in Poplar Creek, Montgomery Co., MA. + 5 M iv. Henry FERGUSON was born about 1868 in , , MS.
6 F v. Nolle FERGUSON was born about 1869 in MS.
Andrew next married Elizabeth "Betty" REDDEN. Elizabeth was born about 1850 in , , MS and was buried in Hoxie Chapel Cemetery, Easterly, Robertson Co., TX in an unmarked grave. + 7 M i. George Marcus Lafayette "Lathe" FERGUSON was born on 31 Mar 1876 in Vaiden, Carroll Co., MS, died on 27 Oct 1945 in Franklin, Robertson Co., TX, at age 69, and was buried on 29 Oct 1945 in MT Pleasant Cemetery, Franklin, Robertson Co., TX. 8 F ii. Elizabeth FERGUSON was born in 1879 in MS.